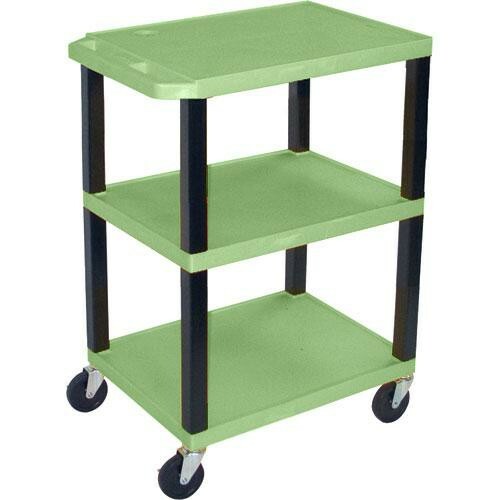 The H. Wilson Tuffy Open Shelf A/V Cart is made from an engineered thermoplastic resin that is injection molded. This cart will not chip, warp, crack, rust, or peel. The shelves are 11.5" thick and will hold about 200 lbs (total). The electrical assembly is recessed making it easy to push this cart through doors and hallways with out the fear of banging into walls and people. The silent casters won't disturb other meetings and groups as you roll this cart through the halls. Box Dimensions (LxWxH) 28.0 x 19.0 x 10.0"